Value | 6log - How does that work then? 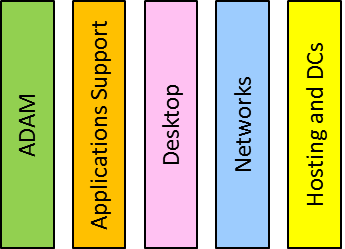 You could abbreviate Service Integration to SI, but this is ripe for confusion with the older usage of SI, as Systems Integration, all about gluing together bits of software and hardware to make new systems, i.e., Building systems rather Running services. There have been a number of landmark deals espousing the Service Integration model , from ABN/AMRO and the “Guardian” model back on 2005, through to the most recent state if the art at National Grid with the recently penned deal with HP ( Computing article on National Grid / HP SMI deal and HP Press Release). I was astonished recently in one of those rare, but memorable, jaw-dropping, goggle-eyed moments when a sales guy from some other organisation opined in a meeting (to paraphrase) “Why all this fuss about V3, there’s some really good stuff in V2”. Everybody in the room looked at the poor unfortunate in deadly silence as he swallowed his foot and half his leg up to the knee and lower thigh, and from that moment he became nobody, a nebbish, a zero. Ouch! 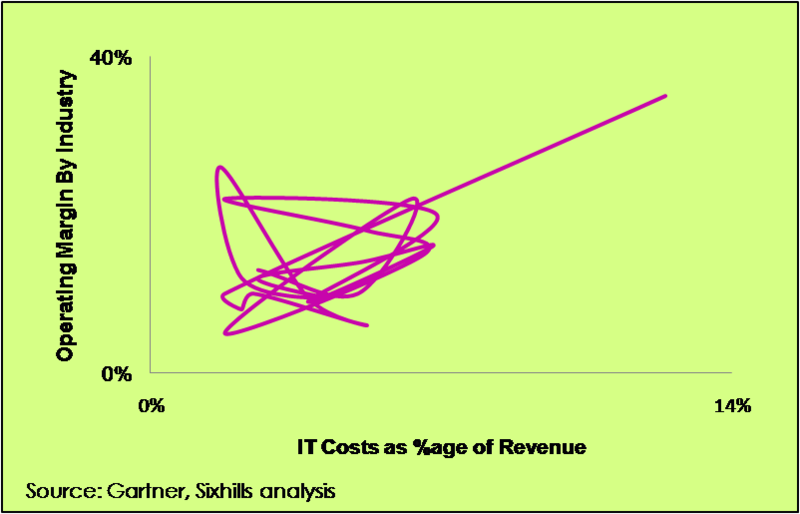 COBIT makes a much broader sweep in its attempt to embrace the whole entity that is a living, breathing IT organisation and seems to fill many of the gaps not covered by ITIL. 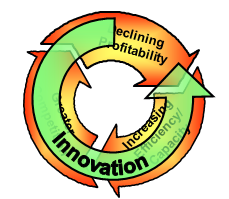 Yes, I know I bang on about Innovation quite a bit in these posts, but it is a common current complaint I hear that innovation has been squeezed out in deals struck in the 2000s, and now the demand is to find ways to enable it again, even to the extent of considering to pay an Innovation “premium”. 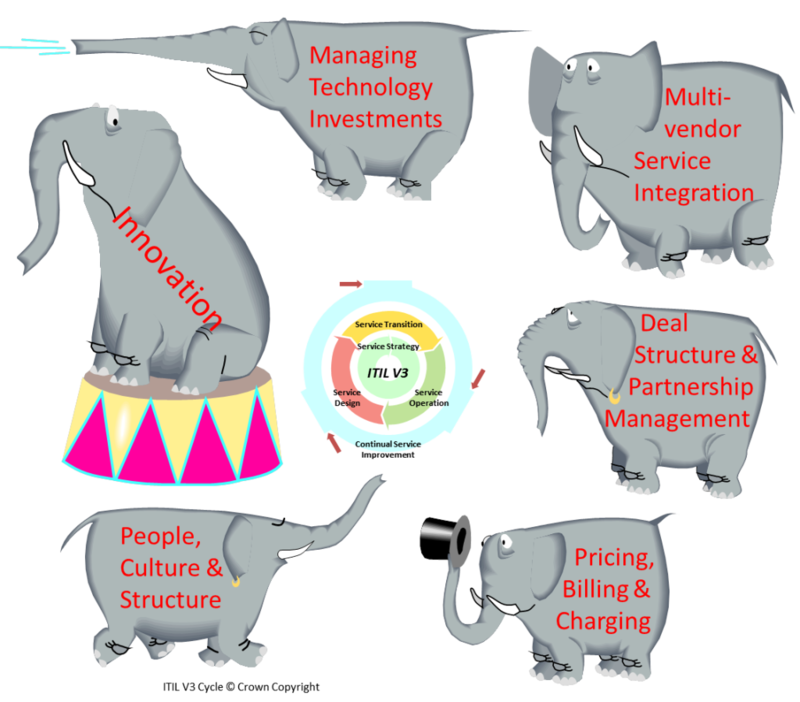 COBIT, founded in GRC, and providing an excellent check-list with which to herd most of the elephants, is as blind as ITIL when it comes to Innovation. If you search through the text of the COBIT 4.1 framework definition doc, you will find the word “innovation” writ not once at all in its 197 pages! Risk management is as central to innovation and agility as it is to the philosophy of COBIT with its focus on control. 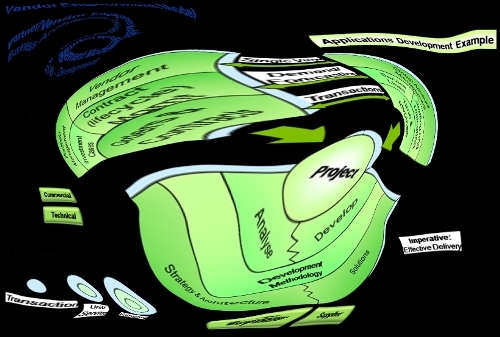 Yet there is a classic schism between the COBIT GRC-based shibboleths and the ways of innovation and agility, and one might cynically draw the conclusion that COBIT is about stopping things getting done, whereas innovation and agility are the polar opposite – “skunkworks” innovation is the antithesis of the GRC mindset, even anathema. 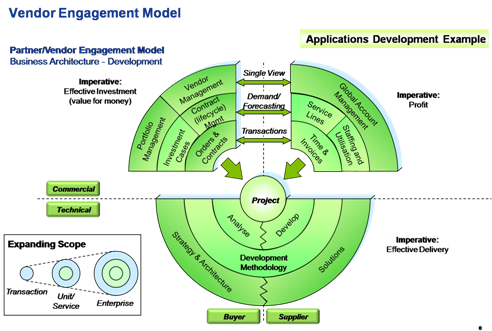 And, of course, COBIT is process-oriented, just like ITIL. Good, but rather 1990s Hammer & Champy and still further to go to get into the 21st century. This does not compute, the base premise is wrong: Yes, High risks, whether processes or otherwise do need controls, but don’t waste time putting controls on low risk processes. Also, processes can be controls, so do we add meta-control processes to control the control processes? – Quis custodiet ipsos custodes ad nauseam. You may think that I am being rather harsh on the solid works of people who have created ITIL, COBIT et al. These frameworks are all useful check-lists of best practice, but need to be used with some care, lest the medicine kill the patient. And they help with the standardisation of service descriptions when making like-for-like comparison somewhat easier in the sourcing and procurement process. However, they are inevitably behind the leading edge. 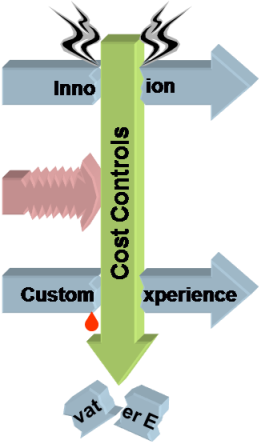 for example, getting joined-up in the customer experience dimension (orthogonal to both towers and process orientation) is yet another step to go. This entry was posted in Uncategorized and tagged Enterprise, Opinion & Humour, Strategy, Value on May 13, 2011 by andy. Recently, I was working with a colleague who exclaimed “You’ve got to be a professor to understand that page” when looking at a consulting 2×2. Indeed there are some great pages in the world that capture some key thoughts or concepts so concisely that they can be expressed just on one page, but need a voice-over to talk through the layers of meaning embedded, maybe like one of those pointillist paintings or a fractal montages that is made up of pictures that are made up of pictures…(but perhaps not a Dali-esque or Picassoid other world view?). Very clever, of course, but it really deserves to be supported by 20 following pages to unpeel the layers and break out the key concepts, etc., etc. 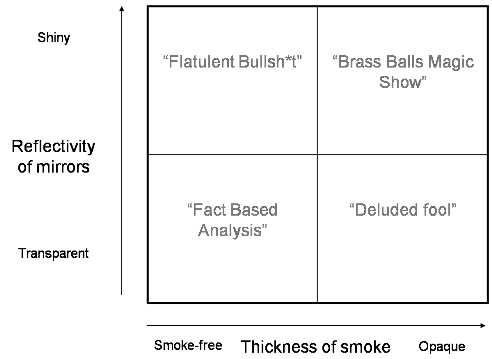 However, there are some charts that are very easy to understand, but they do convey a message that is counter-intuitive, and so take a while to get your head round. 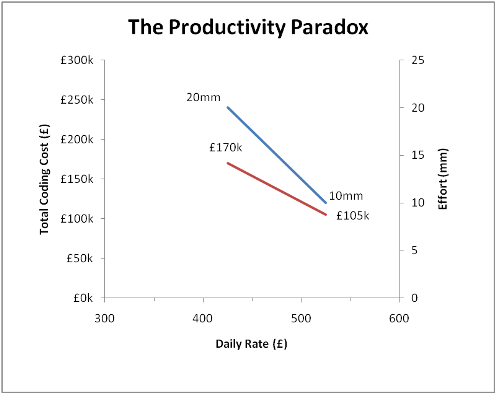 This shows the output of a model of software development productivity which paradoxically shows that total coding cost falls whilst the developer daily rate increases. This is, of course, quite counter to the expectations of typical Aggressive Sourcing gigs which tend to focus on bashing down the daily rates. The Old Wives and proverb writers of yore new about this since the principle of “Pay peanuts and get Monkeys” is well known. The twist in the tail on this analysis is that in the formula P x Q, where P is Daily Rate, and Q is the number of days needed to complete the project, some people (yes, them) are not aware that Q is inversely proportional to P. This is the essence of the move to Agile development methods, which favours people over process (amongst other things). This entry was posted in Uncategorized and tagged Enterprise, People, Value on March 12, 2010 by andy. Recently our esteemed Green Knight, Sir Jonathan Porritt was attributed with saying “Overweight people are ‘damaging the planet'”. Of course it turns out that he said something like this in about 2007, in fact building on a comment by the then Secretary of State for Health, Alan Johnson. But somebody else unearthed it again for some typically twisted reason – nothing can be more topical than mixing global warming with a bit of “fatty slapping”. The hypothesis behind the hype is that fat people use more resources because they eat more food, but why not then include teenage boys (unfillable, as empty fridges around the country can testify), people with very high metabolic rate, and other some such big eaters. Ah, well, the logic goes that fat people also drive everywhere and so contribute more CO2 than thin people who, of course, walk or cycle everywhere. Well, maybe it applies in towns, but it is certainly not true in the countryside, so drawing a different intersection in the Venn diagram I am sketching out here in hyperspace, maybe the headline should have read “Teenage boys and country people with very high metabolic rates are ‘damaging the planet”” – not quite so catchy, or right-on, eh? But, of course, there is a secondary thesis which is that obese people can be “cured”, especially if they all got out of their cars, walked and cycled, and stopped scarfing all the pies, whence their weight would magically drop away and they would join all the normal people in the happy mean. When you look at whole populations analytically then of course you usually see some sort of distribution (Normal or otherwise) of whatever factor (weight, in this case) that you might be measuring. So the theory is that by thinning down the fatties, the shape of the distribution will be changed. However, there are flies in this particular ointment, and if you look around you can find suggestions that obesity is actually a structural feature of a/the/any human population, that everybody has got fatter and that you need to treat the population as a whole, not just focus on the upper tail. All in all, an example of woolly loose thinking gussying up to a political agenda. BMI is one of the weapons in the “fatty slapping” armoury, a metric with some very well documented short-comings, yet standard (mis-)guidance would label people like Lawrence Dilaglio, Jonah Lomu & Mel Gibson as over-weight or obese. Whilst BMI might have some trivial diagnostic uses, some lard-brained, fat-heads try to use it as a decision-making metric, vide ‘Too fat’ to donate bone marrow – the 18-stone 5’10” sports teacher with a technical BMI of 36.1 who was ejected from the National Bone Marrow Register. To make a proper health assessment, you need to have a more detailed look at structural features, like waist size, percentage of body fat and so on, before pronouncing. Just pausing a moment to dissect BMI further, it has units of kg/m2 which is not unlike the metric used to define paper thickness. Many organisations these days used 80gsm printer paper which is more environmentally friendly than the more sumptuous 100 paper of oldAnd even less rich feeling than the 120gsm paper that Tier 1 consultants use to create a table-thumping report – the dollars are in the loudness of the thump. Thus BMI is a prime example of a benchmark ratio or KPI that is NOT a good basis for making decisions, as it fails to take account of significant structural factors. This parable provides an important lesson for practitioners in the world of Information Technology Economics, where many a ratio is measured and analysed by pundits including Gartner et al, a classic being “IT Costs as percentage of Revenue”, one of their IT Key Metrics. 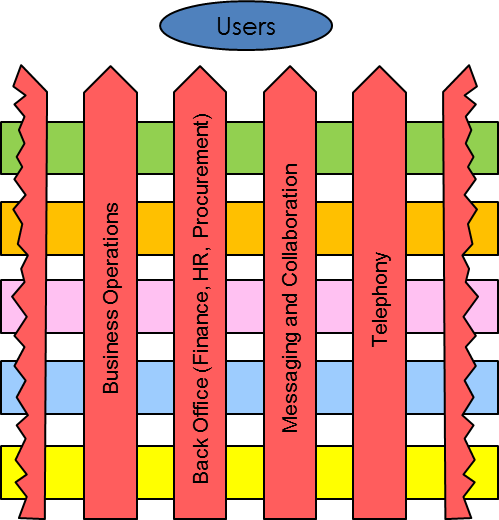 then you might surmise that it is quite possible that the Revenue numerator has significant elements that are certainly outside the direct control of the IT organisation, and indeed outside the control of the company, whereas the IT Costs are defined largely by the structure of the organisation, its distribution channels, and internal policies and practices. The top line is also, I conjecture, more volatile than the denominator, and being mostly outside the control of the IT so a very unfair stick to beat the IT donkey with. So in qualitative logical terms this metric is certainly appears to be a very poor ‘apples and oranges’ comparator. If you stretch the analysis further, you can ask the question “what does it mean?” Is the ratio intended to show the importance of IT? or IT leverage/gearing (bang for the buck)? OK, is is a deliberately silly chart, just to make the point that this is clearly a wobbly relationship. What this shows is that there is no particularly significant linear relationship between these two key metrics and Operating Margin, so quantitatively, the ratios do not really tell you anything about how IT costs/investment drive overall business performance at all. The whole averaging process loses information too. 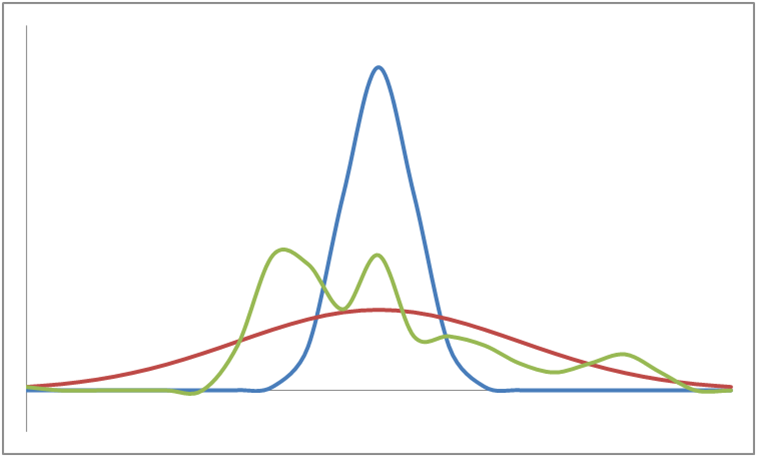 Look at the four distributions below, they all have the same mean (i.e., average) but are wildly different in shape. Without further detail on their parameters than just the mean value of the curves, you cannot make a sensible comparison at all. …Oh, and maybe, some vague diagnostic indication that there may (or may not) be something worth looking at with a more detailed structural review. So, why not just go straight there, and dig out the real gold! And so the morals of this story, O, Best Beloved, are that just because you can divide two numbers, it doesn’t mean that you should, and be prepared to dig into the detail to truly understand how cost and performance could be improved. This entry was posted in Uncategorized and tagged Opinion & Humour, Technology in Business, Value on July 20, 2009 by andy. Fool Us? More Fool you! 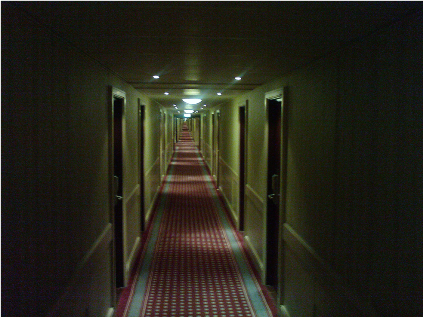 …which brings me, of course, to carpets of which this place had many, many hectares. 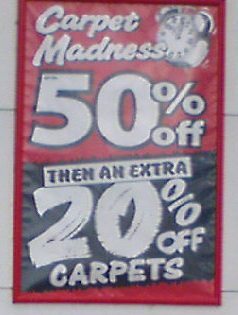 Carpet stores have always seemed to me to be one of the last hangouts of stone-age man, well, stone-age marketing anyway. Apart of the never-ending sales, and boring adverts, they seem to harbour troglodytes who have not worked out that it might just be better to treat their customers with a little bit of intelligence. The most insulting manifestation of this is the latest wheeze, the “cut, and then cut some more” sale pricing. 50% and then 20% more is, of course, supposed to make us think they are cutting prices by 70%, but, no, by a clever trick of arithmetic it is only 60% (the 20% only applies to something already cut in half). This entry was posted in Uncategorized and tagged Opinion & Humour, People, Value on September 8, 2008 by andy. Subtext: Because we really don’t trust our agents or our customers for that matter and we need to be able to go back and find out what you said and then tell you that you were wrong and that you didn’t say what you know you said. Your call is being held in a queue and will be answered shortly. Subtext: The people in front of you who are more important than you and were given a better phone number to call. Subtext: but we have not staffed our call centre properly and things are getting a bit out of hand because we are operating on the cheap. कॉल करने के लिए धन्यवाद British Tap . मेरा नाम Nigel है . मैं आज की मदद से आप कैसे हो सकता है ? Eh? Oh? My boiler is leaking. Sorry, what did you say? Yes, of course, that old cost-cutting gambit of the offshore call-centre. Indeed, whilst the overseas call centre pendulum has been swinging back on-shore in the last year or so, now with cost crunch following credit crunch we can expect that trend to reverse somewhat. Call centres and the customer experience that go with it are not the only things to get crunched when belts are tightened, discretionary project spending is one of the first things to be reduced,with projects either being deferred or cancelled. Whilst this is a very hand tap to close, by turning off spending on projects willy-nilly, as snuffing boring, run-of-the-mill sustaining projects, genuinely innovative activities also usually get the chop. … with good stuff getting damaged at the same time as cutting off all the bad, spendthrift behaviours. 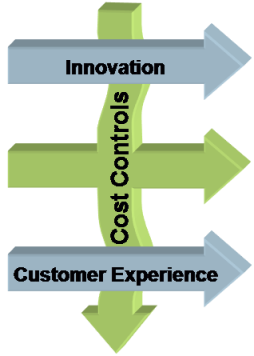 …to take out cost and building competitive advantage through innovation and better customer experience. Благодарим ви за свикване на British Tap бойлер гореща линия. Казвам се Tony. Как мога да ви помогне да днес? 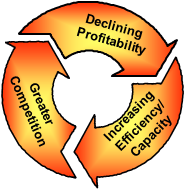 This entry was posted in Uncategorized and tagged Strategy, Technology in Business, Value on May 18, 2008 by andy.